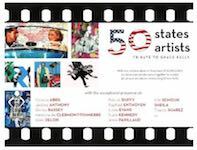 From 19 to 28 April, an exhibition of 50 artworks by 50 American artists, celebrating the 90th anniversary of the birth of Grace Kelly, Princess Grace of Monaco. The event was developed by Nicois artist Stephane Bolongaro, best known for his dog sculpture, Totor. Members of the Club des Residents Etrangers de Monaco are invited to attend the official opening. For more information and RSVP before 23 March, email info[at]crem.mc or phone +377 97 98 01 77.